- Rhinestones, glitters, flakies, etc. 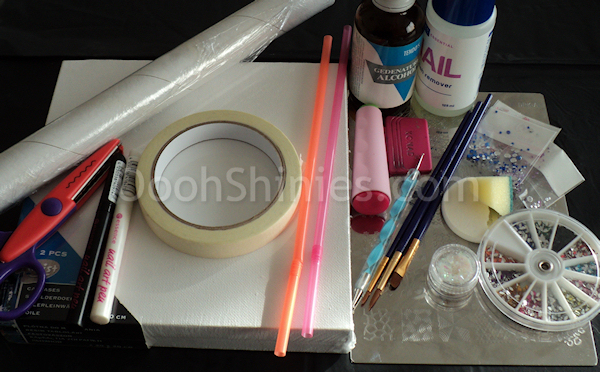 If you want, you can of course just freehand something onto your canvas and go nuts with different polish techniques; use nail art pens for fine lines, go for big sugarspun lines, drip the polish on, decorate with glitters, rhinestones, etc. 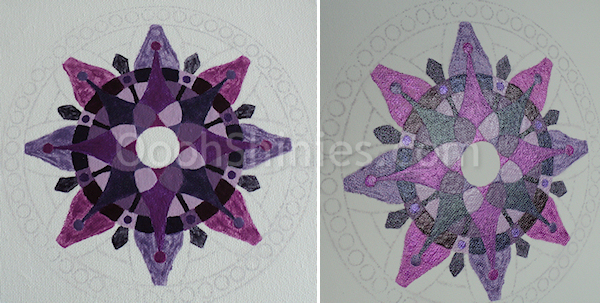 Here are some quick examples of different techniques, as you can see using a brush with aceton can create a water color look. 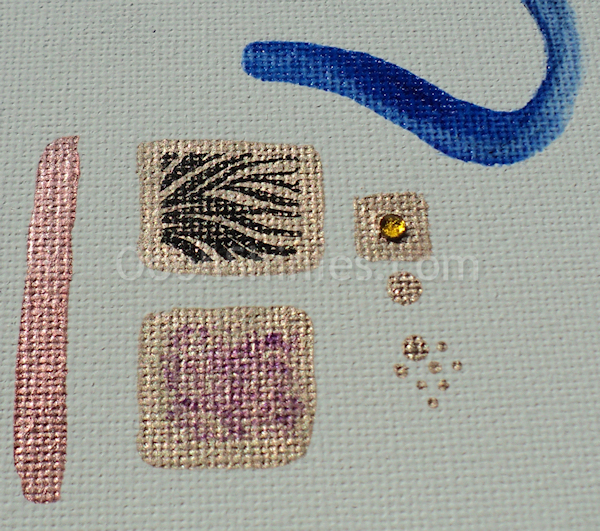 I used masking tape to make sure that the saran sponging and the stamping didn't go outside the golden background. If you stamp, make sure to press pretty hard on your stamp. As you can see, I didn't and because of the texture of the canvas, ir didn't transfer well on all spots. Although that can have it's charm as well! 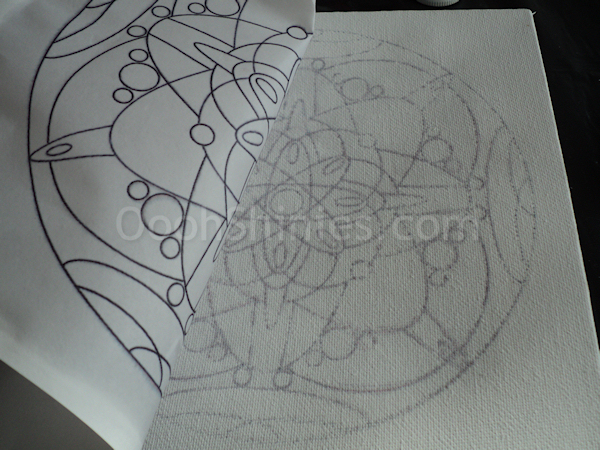 But as I said before, freehanding didn't work out for me, so I decided to print an image and transfer it to the canvas. 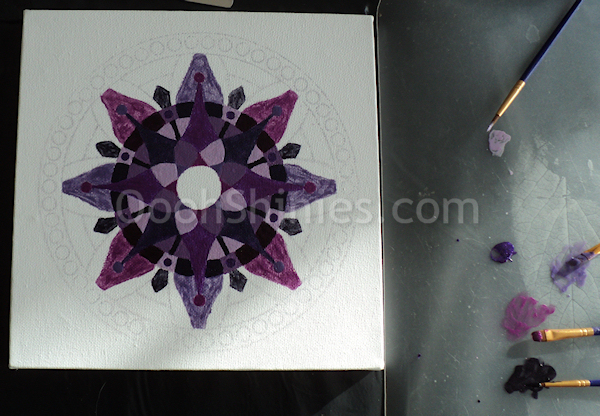 The images that I'm using are some of my mandalas. I applied the printed image upside down to the canvas and folded down the edges, to help me keep it in place. 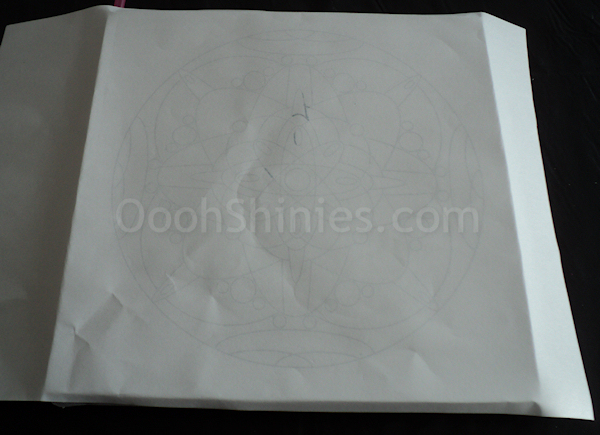 Because the paper is slightly see through, I could easily see if it was somewhat centered. The canvas that I'm using is 20x20 cm. I did notice I had to keep adding alcohol and rub every spot quite a bit, but you can check in between by holding down 1 side of the paper on the canvas so it doesn't move, and peeking under the other side. 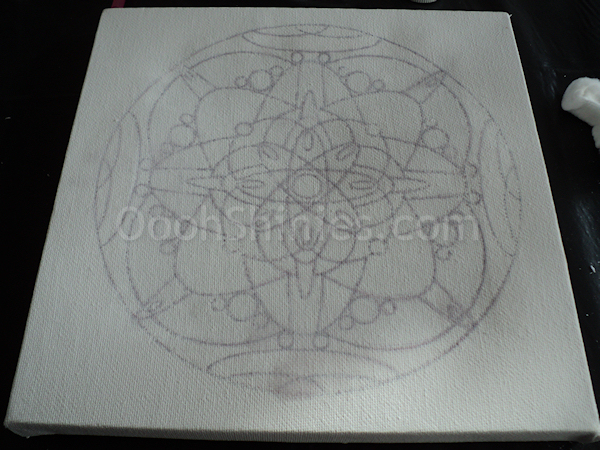 When it's transferred well enough, let the canvas dry. 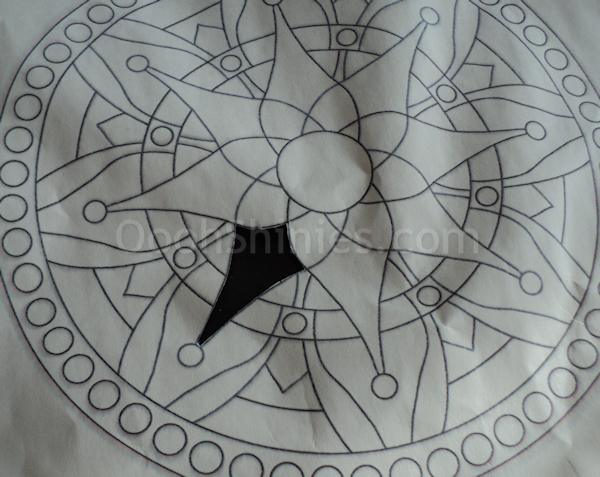 When it's dry, you can start coloring it, here's the one that I'm working on now. Polishing like this reminded me of paint by numbers from when I was little :) I just went for basic polish for this one. Most polishes that I used did need 2-3 coats, but when the polish thickened up a bit on my placemat 1-2 coats were enough. You could of course just go for 1-coaters straight away, also to save polish! I also noticed shimmers and glitters aren't as obvious as they'd be on your nails, because of the texture of the canvas (I don't plan on using top coat when I'm done :P), and metallics look great! Here I'm working on the outer leaves kinda things. You could also use saran wrap, sponging, splattering or stamping to add extra detail to your design, the area around it can be taped off (make sure the polish around it is fully dry) or use your second printed image and a hobby knife/scissors to cut out the area you want to work on. 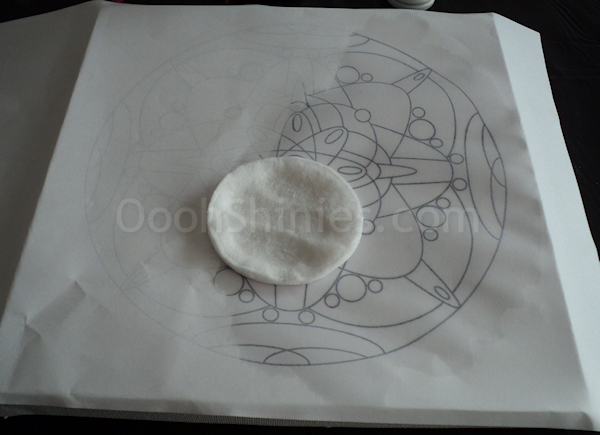 Then place the paper on your image and sponge/stamp/whatever. The example on the photo here isn't flat because it's the image I used for transferring which got wet from the alcohol. I didn't print a second one of this image because it's my first one and I'm just going for basic polishing (maybe a rhinestone here and there, will see later). I can't capture the shimmers and different shades so well, and my image is far from finished as you can see, but I really like how the image changes color depending on from what angle you look at it! Because I'm not fully sure yet how I'll finish this painting and because it does take quite some time (at least, it's my first and so far I paint fairly slow), I went ahead and posted this how to already. For my Dutch readers, you can buy canvas and brushes cheap at the Big Bazar, but Kruidvat and Action often have these kind of things as well! Besides paintings, I also polished rings and wooden beads. My sister made a pretty necklace for my mum and included some of those beads as well, I think that was a nice personal gift :) You can see those beads here, and some polished rings here. But there's a lot more you can polish, like clear phonecases, Christmas decoration or even furniture!